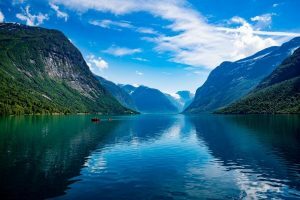 These two Nordic countries share some characteristics including dramatic landscapes, Viking history, and beautiful trails. But once you scratch the surface, each is distinctively unique. Iceland is wildly popular (for good reason), while Norway—still a bit under the radar—is more recently becoming the regional darling. Can’t decide which trip is for you? Maybe you’re intrigued by both countries and simply want to know what to expect. Perhaps this comparison will help you. No matter which destination you choose, we know you’ll have an amazing time exploring a new place, meeting friendly locals, and sharing the experiences with friends, family, and your small group of adventuresome travelers! Iceland’s landscape has been shaped by volcanic and seismic activity. 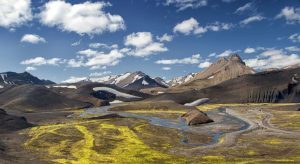 Vast lava fields, black sand beaches, and dark, craggy cliff-faces contrast with moss-carpeted valleys, powerful cascading waterfalls, floating icebergs, impressive glaciers, deep ravines, and hot springs. It’s not called the “Land of Fire and Ice” for nothing. 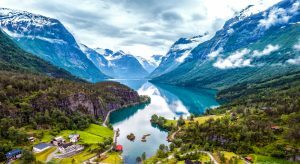 Norway’s landscape, on the other hand, has been carved by glacial activity and water. It is well-known for its fjords, where steep slopes covered in pine forests descend into narrow waterways. Higher up, the vegetation thins out to low-scrub and exposed rock. You’ll see glaciers here, as well as rocky shorelines and soaring, misty waterfalls. 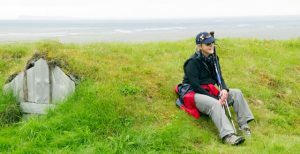 Generally, hiking in Iceland is not difficult. It’s mostly flat or with rolling hills, although the terrain can be rough, especially when hiking in lava fields. Our Hiking the Land of Fire & Ice is rated 2+. This means easy to moderate walking and hiking for 2-5 hours per day with minimal vehicle support. Elevation gains are usually between 200 and 400 feet, with one day having an optional climb to the top of Skogafoss Waterfall, a total of 700 feet. Hiking in Norway is a bit more rugged with steeper trails. However, Norway’s trails are well-maintained and many have built-in stone steps. 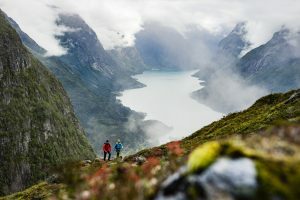 Our Western Fjords Adventure is rated 3, which means moderate hiking, 3-6 hours per day. Elevation gains are up to 1,700′ and some days, depending on the weather, we may do some longer hikes of 7-12 miles. On both our Iceland and Norway adventures, we enjoy a 1/2-day glacier walk. This is weather permitting and all necessary equipment is provided, including crampons and ice axes (although in reality, the ice axes are more for show!). 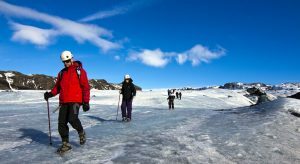 We hike with experienced mountaineers with a great deal of knowledge about glaciers and safety procedures. Both trips also include a kayak excursion. In Iceland, this is a 1-hour jaunt. In Norway, it is a full day with stops along the shore and for lunch. 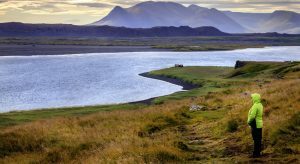 An optional horseback ride is available at an additional expense in Iceland, while an RIB-boat fjord cruise in Norway takes us around a UNESCO World Heritage Site fjord to view sky-high waterfalls and villages at the water’s edge. July and August are among the driest months in Iceland, although weather is still quite variable. You are unlikely to have sunshine every day, but it is also unlikely for it to be cloudy for long. July and August bring near round-the-clock daylight. Average temperatures range from mid-40s to mid-50s. Summer in Norway brings long days full of sunshine and warmer temperatures. As with Iceland, weather is variable and while there won’t be sunshine every day, it is also unlikely for it to be completely cloudy. June, July, and August see 18-20 hours of daylight. Average temperatures range from the mid-40s to mid-60s.